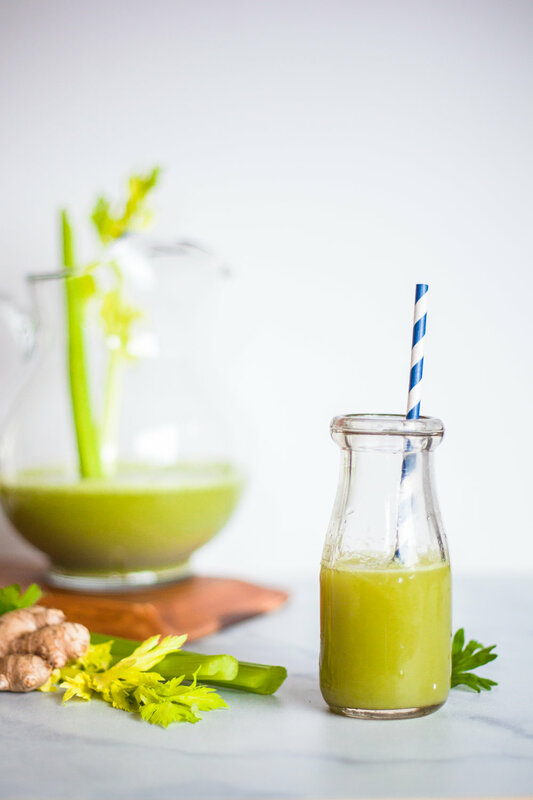 honestly, i just felt like taking a few photos when i recently juiced some celery with ginger. no recipe here! although, i wished i had a lemon to add to the mix here. i know celery juice is allllll the rage for health purposes, but i do not like celery. adding fresh ginger really makes it drinkable for me and a bit spicy too! lemon would be really good in this. i juiced up 2 big bunches of celery stalks and a big piece of ginger (probably 5-6 inches, & left the peels on) and yielded more than 24 ounces of juice. if you despise cleaning your juicer like i do, this was a great item to bulk-juice and store in a jar in the fridge. i drank about 6-8 ounces of the juice each morning until it was gone. also….immediately after cleaning the juicer, i went to put it away and dropped a few pieces of the machine down this dark cabinet abyss in our pantry and i have no idea how we’re going to get them out. there’s probably a treasure trove of half eaten bags of chips down there, too. 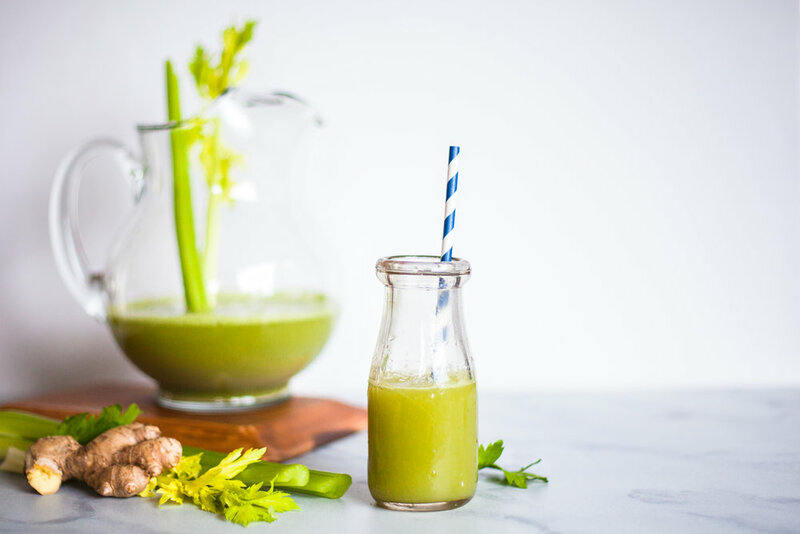 here’s to the memory of this celery + ginger (+lemon) juice refreshment, and to hoping we can fish the juicer parts out from the deep dark corner of the pantry in 2019.
i nevvverrrrr ever liked grape juice and/or grape flavored items of any sort. however, i love grapes. we bought these concord grapes at our local produce stand recently, not really knowing what we were buying. when i got home and smelled and tasted them, i was like GASP this tastes like artificial grape! i then had a real epiphany that "artificial grape flavored" things actually are accurately flavored after a type of grape......i had always thought it was a big made up sham flavor, like the way that watermelon things don't reeally taste like watermelon, ya digg?? from back in the day that clearly state that their grape juice is made from 100% concord grapes. durrrrrrr, quinn. i guess i didn't care to pay attention to them because i never thought i liked grape juice. on youtube. spanky is sooo dang cute in this commercial and he makes me extra excited about my grape juice. sidenote, i'd be prettyyyyy dang confident entering a little rascals movie trivia competition and/or line-reciting contest. this might be the movie i watched the absolute most growing up. none of that old tymey little rascals stuff, just the 1994 version with all the cute kids. "thank you, my good man"
if you give a hoot at all about these rascals. makes me feel old as the hills. these grapes parade around looking a lot like big fat blueberries. we decided to put them through the juicer and see what happened. we ran the grapes through the juicer maybe 3 or 4 times until it seemed like most of the juice came out. and we were left with a delicious and beautiful fresh glass of frothy 100% grape juice! it was perfectly sweetened. we didn't add anything except a little bit of cold water. we've been keeping it in a jar in the fridge and i go take a big swig every now and then. its just so flavorful and juicy! the frothy stuff settles on the top after being refrigerated for a while, so you could scrape that off if you don't want the foam. there's just pure grape juice down below. 100% juice for 100% kids, like meeeeeeeeeeeeeee.